We can assist with the right hot water system for your needs including standard tank water heaters, Heat pump water heating and the energy efficient continuous-flow water heaters. We can perform repairs, maintenance and safety checks and new installations on all brands and models of water heaters and even remove your old one as part of a total hot water solution. Is it time to upgrade to mains pressure hot water? Is your HWC costing you excessive money to run? (Leaking valve or pipework). Do you want an energy efficient system? 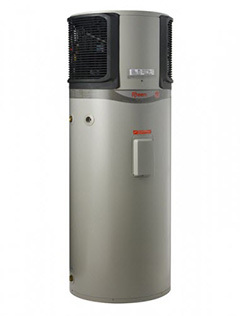 (Solar or heat pump hot water). Is your hot water too hot? (We can check and fit a tempering valve to protect the consumer from burns). The use of hot water heat pumps has become increasingly popular due to their ease of installation and power bill savings. A hot water heat pump uses outside air to heat water, so it is perfect for eco-conscious homeowners or those wanting to reduce their energy bill. Unlike other types of hot water systems that use electricity to keep water warm, electricity is used solely to run the system. As water cools down, it circulates though the heat exchanger where it is warmed up. Hot water heat pumps are available as a single unit or be retrofitted to an existing electric hot water cylinder and are relatively straightforward to install. The warmer the outside air is, the better the pump will run. Generally speaking, the Marlborough climate is suitable for this type of heating. Even if the temperature in your area tends to drop below 7 degrees Celsius, we may be able to provide you with a pump designed to handle cooler temperatures. In many Marlborough homes, heating water for household use accounts for about 30 - 40% of the average home energy bill. So it’s no surprise that many families seek ways to lower their energy bills through a more efficient hot water heating system. Harnessing the sun’s energy to heat water is very practical and makes sense on so many levels. It’s free, always available and kind to the environment. And, best of all, a solar water heating system can help you cut your energy bills in half! In Marlborough, we are blessed with a high number of sunshine hours each year, so it makes sense that members of our community are increasingly interested in utilising solar in their homes and businesses. Solar hot water heating isn’t a new thing, though – it’s been in use for many years, but continues to grow in popularity each year. Do you need advice on getting the right hot water heating solution for your home?